Yesterday was a momentous day for Mr. Myrt, since Archives.com made the following announcement. Many of his Norwegian immigrant ancestors continued to practice Lutheranism as they carved out their lives in America. 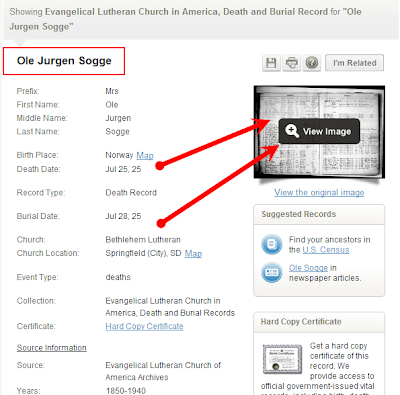 Archives.com Publishes Millions of Lutheran Church Records Archives.com is thrilled to announce the release of the Evangelical Lutheran Church in America (ELCA) birth, marriage and death record collections! These three collections total nearly 4.6 million records. Archives.com, in partnership with the Evangelical Lutheran Church in America Archives, digitized and indexed approximately one thousand rolls of microfilmed records from churches now affiliated with the ELCA. These records have never before been online. The records in these collections date from the mid-1800s through 1940 and include births, baptisms, confirmations, marriages, deaths, and burials. Details vary from church to church, but often include parents' names, dates and places of the event, and other biographical details. Many of the churches were founded by immigrants from Norway, Sweden, and Germany and had immigrant families as their members. These records could hold the key to finding your origins in the Old World. Researching in church records can be challenging, as you often don't know exactly which church your ancestors attended. 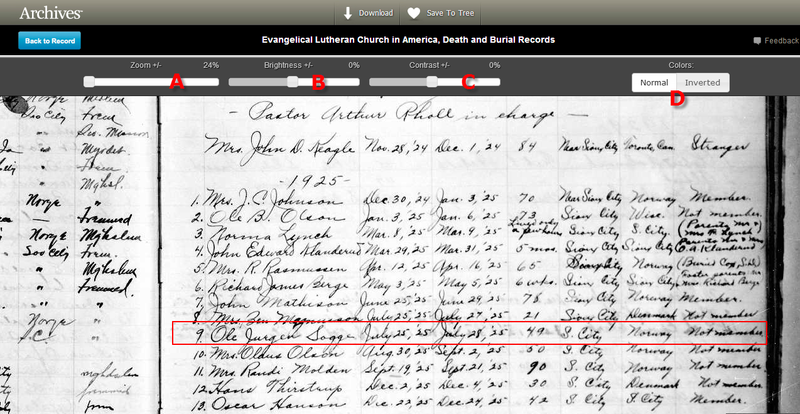 With the ELCA collections, you don't need to know the specific church your ancestors belonged to. These collections brings together all of the pre-1940 records for churches affiliated with the ELCA. The ELCA collections add to the 2.5 billion records that are currently available to Archives.com members. Not a member? Sign up today for a seven day free trial! 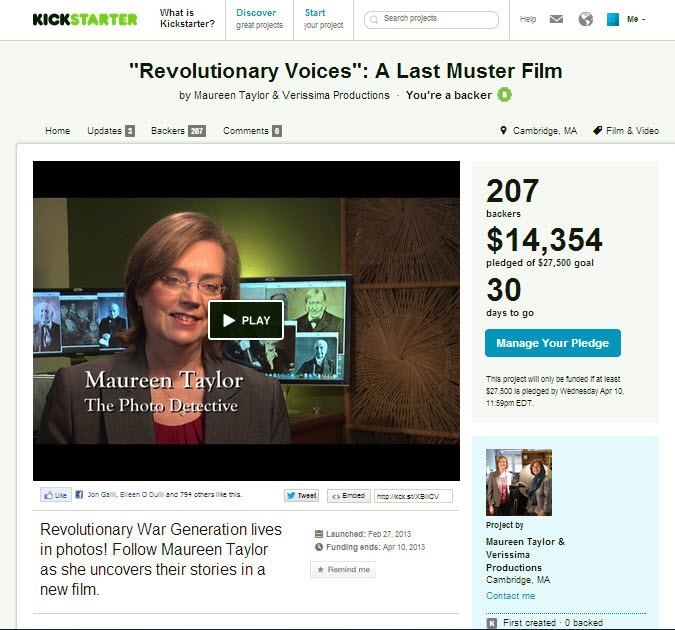 Archives.com makes family history simple and affordable. 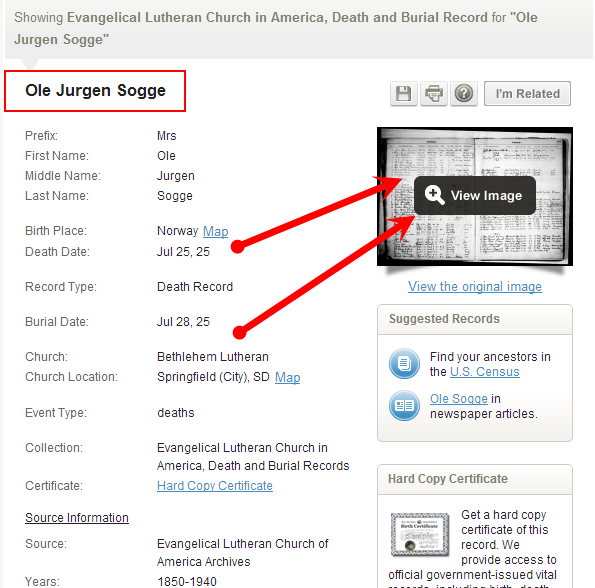 So Ol' Myrt here decided to try it out, searching first for Mr. Myrt's grandfather Ole J. Sogge. We know his death date from family records. Thanks to Archives.com we now have the original church record of his death and subsequent burial in Sioux City, Iowa. We've been to the grave site, but lacked the church records until now. Here's the image itself. Thank heavens for a wonderful church secretary or Lutheran minister with legible handwriting! Click to view a larger version of this image. 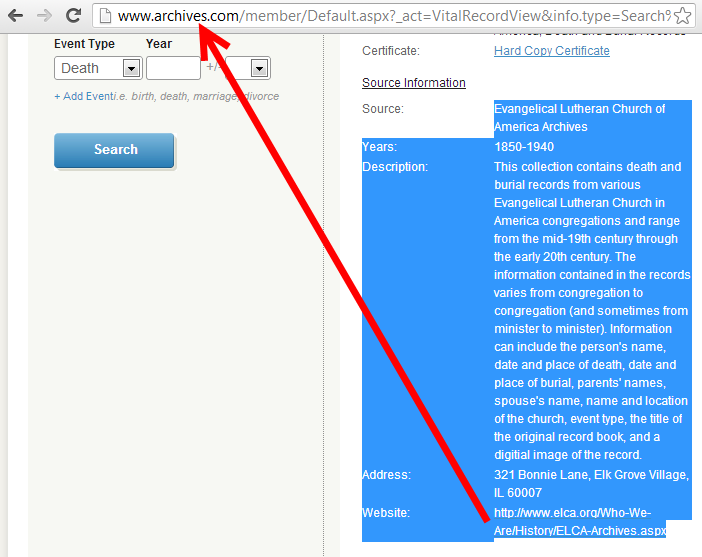 This information for a citation may prove a little confusing to beginning genealogists, since the ELCA-Archives website is not the location of the image - it exists on the Archives.com site. I assume from the description the original record books are in the collection of the ELCA-Archives. For more experienced researchers, this is no different from citing an 1812 Widow's Pension file housed at the National Archives displayed at Fold3.com. I think anyone joining GeneaBloggers ought to just go with the flow until he/she "gets" what an awesome, supportive, funky, creative, inspiring, wacky, fun group this is. We're 3,000+ strong. Recently someone contacted Thomas, insistently expecting him to change the name of one of the time-honored blogging prompt titles. Thomas explained the meaning and history of the blog prompt, but the newbie would hear nothing of it. When joining a new group, don't start out by trying to drastically remake things. Get to know the members. See where you can fit in. The last thing you'd want to do is alienate everyone by trying to throw out years of tradition. Yes, new blood is a good thing. Fresh ideas are welcome, but not from a guy or gal who starts out by shooting down significant traditions. Members took offense at the pesky newbie's attempts to overhaul our system. That is not to say we are strict or "un"adaptable. Indeed we've grown to embrace many points of view and to appreciate our cultural and ethnic diversity. We understand our variety of writing styles, and accept that some write with a technical slant while others write purely to share the story of a family's immigration to a new and different land. We feel the excitement when one of our own busts through a brick wall and shares the triumph (and all the cool details) in a series of posts. Some write including footnotes, some with less formal in-line citations, but all are careful to share where we learned this or that. Copyright infringements are fiercely supported by our group when even one in our midst gets splogged. We argue a point not in a competitive way, but to better grasp the idea being expressed. We realize for all our individual contributions, we are better for also being in conversation with the rest of the group. We know each other. We send prayers when one is nearly down for the count. We mourn the loss of those who have gone on before us. We rejoice at births, weddings, book publications, newspaper articles and TV interviews. We are likewise thrilled by reunions of once lost loved ones and gatherings of heretofore unknown cousins. When we attend the same regional or national conferences we wear our tiaras and beads proudly, happy to spend even a few hours together, perhaps over a meal. We step up to the plate and help by giving a class scheduled for another who is unable to present due to unexpected accident or illness, a father's sudden death or 4 feet of snow in Flagstaff. In other words, we've got each other's back. From the publisher we discover there is a detailed .PDF file with a full list of contents. See also a sample exercise to wet your appetite for this "next big thing" book by one of our favorite authors. 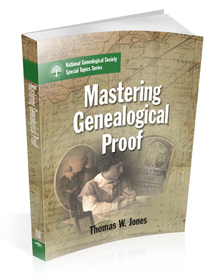 "Mastering Genealogical Proof aims to help researchers, students, and new family historians reconstruct relationships and lives of people they cannot see. It presents content in digestible chunks. Each chapter concludes with problems providing practice for proficiently applying the chapter’s concepts. Those problems, like examples throughout the book, use real records, real research, and real issues. Answers are at the back of the book along with a glossary of technical terms and an extensive resource list." 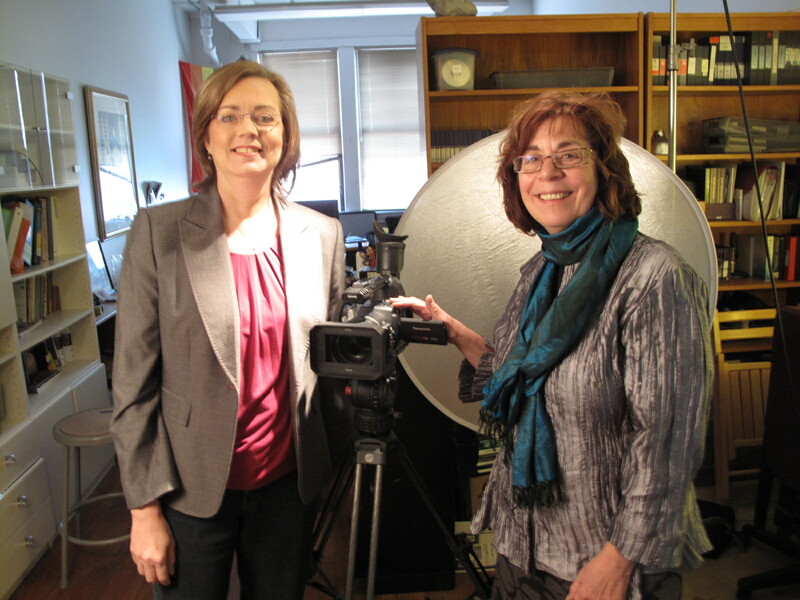 Dr. Jones teaches at a number of well-respected genealogical institutes, including the Advanced Genealogical Methods course Ol' Myrt here recently completed at the 2013 Salt Lake Institute of Genealogy. 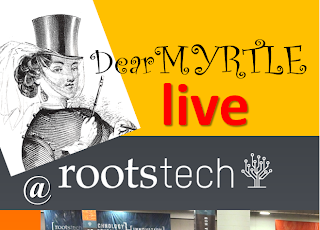 Just received confirmation that MONDAYS with MYRT will broadcast LIVE from the world-famous Family History Library on Monday 18 March 2013 beginning at 10am to noon in the 3rd Floor Glass Conference room. Between now and then, I'll see who is in town early for #RootsTech 2013, and start a fantastic line-up of interviews for a lively conversation. It would be a great way to promo RootsTech in addition to the blogging and research work we find folks are doing in this fabulous research facility. Join us outside the 3rd Floor Glass Conference room at the FHL starting at 9am. Be sure to click the "feed" tab. The Hangout will not start broadcasting here until I press the record button at the top of the hour. It may take a moment for the video stream to kick in.